Miss Mustard Seed is delighting everyone with her new Milk Paint. 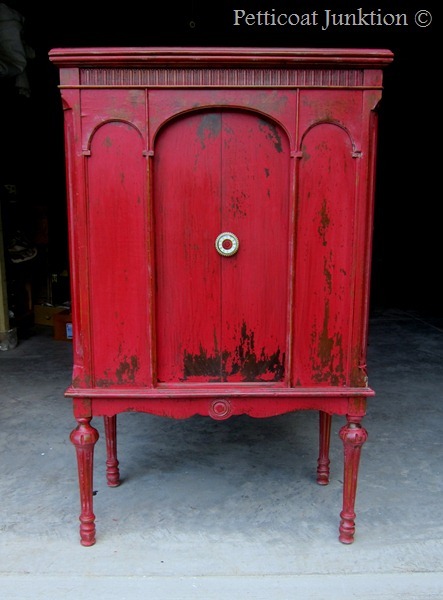 This wonderful old radio cabinet was totally transformed into this very cool linen press by Petticoat Junktion using Miss Mustard seed's tricycle colored milk paint. The milk paint is also incredibly easy and fast to apply. The paints wonderful chipping ability means you get the aged look without distressing your painted furniture by sanding it back. You also use very little milk paint on your painted furniture making it incredibly economical. See what this gorgeous piece looked like before and get the full instructions by clicking here at Wowed by My First Miss Mustard's Seed Milk Paint Project. Here are videos by Miss Mustard Seed showing how easy her new milk paint is to apply.